Reince Priebus resigned as the White House Chief of Staff this afternoon. John F. Kelly, who had previously the held position of Secretary of Homeland Security, has been named as his replacement. The image above was captured in the Oval Office on 25 July 2017 during Donald Trump's interview with journalists from the Wall Street Journal. This scenario is reminiscent of a bar scene - or that of an elementary school playground. Most notably, the two men are staring at each other. Both Priebus' and Scaramucci's central eyebrows are lowered. Their lips are thinned and horizontal. Each of their faces are expressing anger. Note Scaramucci's stance. His heels are planted several inches closer than his shoulder's width. Yet his feet are angled outward - and this gives his overall foot position, and his lower body configuration, a higher alpha tone. Mr. Scaramucci also has more of his weight on his right leg - leaning toward Mr. Priebus. 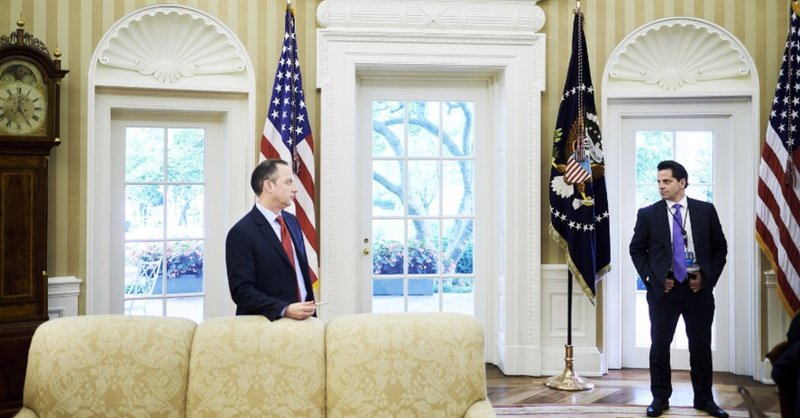 Reince Priebus is leaning on the back of the coach - with his shoulders slanted - leaning away from Scaramucci. This gives him a significantly less alpha (more beta) appearance. 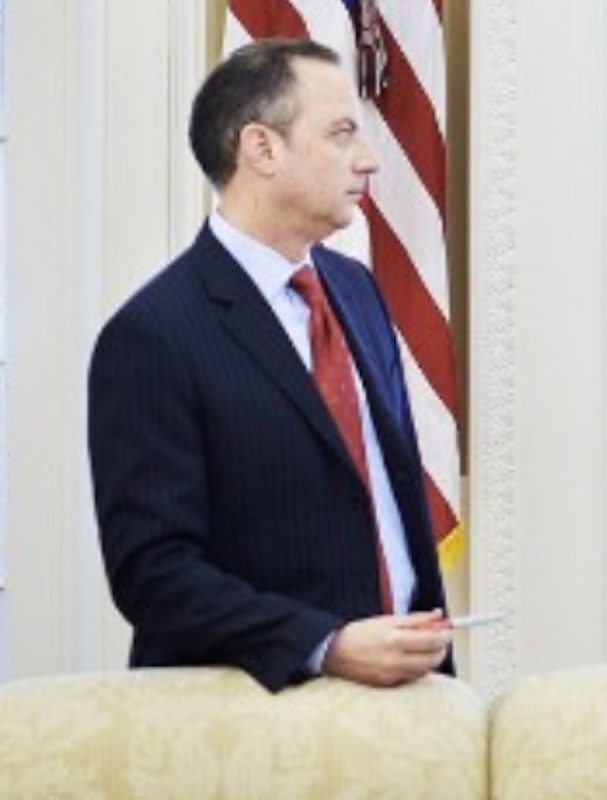 An additional subtle but important gesture here is Priebus' pointing of an orange sharpie at his nemesis. 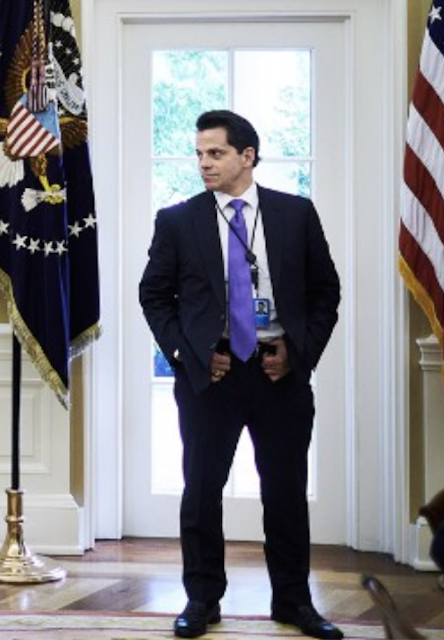 The act of pointing a pen/pencil/marker at another person serves as a surrogate for the more alpha (hyper alpha) index finger pointing (a nonverbal signal Scaramucci practices in abundance). Another body language component in this moment, perhaps the most profound signal of all, is Anthony Scaramucci's hooking of his thumbs in the top of his belt/waist of his pants. Because of the other body language present, this "Thumbs Hooked in Belt" dynamic signals aggressiveness and a surging of his adrenaline. In many contexts, especially between two males, this particular nonverbal clustering of Mr. Scaramucci's would portend a high probability of an escalation from a verbal disagreement and aggressiveness - to that of physical aggressiveness/violence. A profound nonverbal signal in this image is each man's relative position to the President's desk - Mr. Scaramucci is much closer while Mr. Priebus' is significantly further away. Summary: Reince Priebus is acquiescing his West Wing power while Anthony Scaramucci is very much asserting his dominance. This image captures a moment which is very much a visual metaphor for a classic Alpha-Beta dynamic.